Air Conditioning for Your Classic VW | Beetle | Bus | Super Beetle | Fastback - Classic - Vintage VW Beetle Air Conditioning Units - Easy to install! 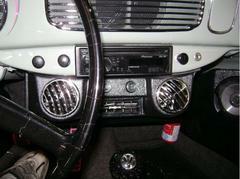 Our Air Conditioning kits for standard VW Beetles are top notch. They come in two different styles, and both reasonably accurately simulate the underdash units that the VW produced back in the day. Not only do they look great, but they'll keep you cool on the hottest of days, are made of the best of materials, and hardly take away any power from the motor using newer air conditioner compressor technology. The install is easy-- and call us if you have questions!